The four-star Hotel Bucintoro occupies a spectacular setting on Venice's waterfront, away from the worst of San Marco's high-season crowds but within an easy walk of the Doge's Palace, St. Mark's Basilica, and other tourist landmarks. It faces a small square next to the Naval History Museum where megayachts, hotel barges, and other large boats are often moored. As you leave the Alilaguna Linea Blu and ACTV waterbus pier, turn right and walk to the stone bridge. 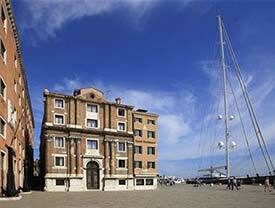 The Hotel Bucintoro will be straight ahead of you, immediately after the Museo Storico Navale. Get off at the Zaccaria stop, turn right, and walk along the waterfront until you reach the Hotel Bucintoro. You'll need to cross three bridges, but otherwise the walk is over level pavement.